MacDailyNews Take: Now, they’ll have to settle for cheap, fake iPhones from the likes of their IP-trampling employers. MacDailyNews Take: “In a tweet sent from a real Apple iPhone.” As opposed the the fake iPhones that Huawei peddles to the ignorant and/or cheap and forces their employees to use… or so they think. As always: If it’s not an iPhone, it’s not an iPhone, you green-bubbled heathens. yesterday there were a bunch of articles saying how smart Huawei was as they were dominating phones in China. I guess the staffers ARE smart as they use iPhones. If you make & sell affordable watches for a living (say Timex) and you make it the biggest brand in the world and you make a very good living doing it, are you expected to live the lifestyle of your customers? If you sell enough Timex watches that you can afford a Rolex, I say more power to you. Just don’t the Rolex at a Timex marketing event. It’s unreasonable to expect Huawei employees to exclusively own & use Huawei phones. But from a marketing perspective, it was a bad mistake & the responsible parties should be disciplined, which it sounds like they were. 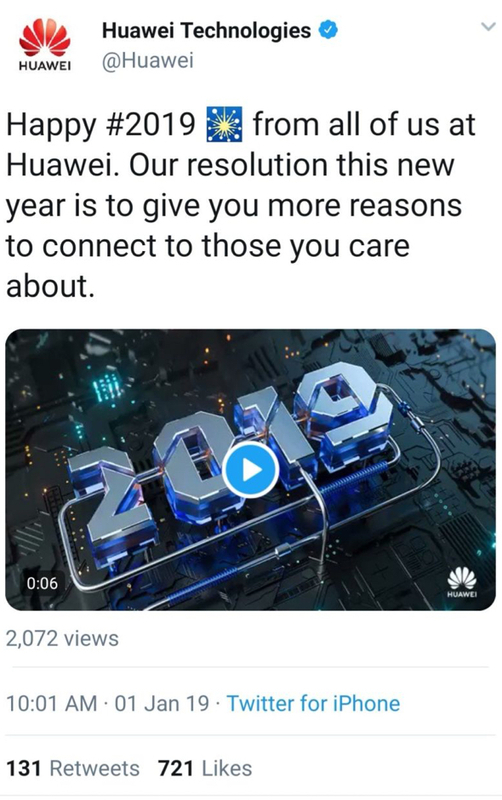 thing is Huawei is also marketing themselves as a ‘high end’ brand. Well the smart phone era is only a dozen years old (as of Jan 7, 2019) so who wins and who loses over the next decade hasn’t been decided yet. Yes, the bottom end phones around $200 will take the volume leader position. But changes will occur. The “phone” has already morphed into the Apple Watch and that is not the end-all. My guess is Apple must face the reality that the difference in price from their top of the line phone to the bottom line phone must be like a max of 50% of the premium model. Something like in the car industry. I don’t care about selfies, face ID unlocking and many other features which no doubt cause some in Apple headquarters to have orgasms. Yes I do “tech things” but it is very easy to get overdosed. I hope Apple reads this MDN post.